During October 2006, an underwater survey was conducted west of Netanya (Permit No. A-4690; central map ref. 18560/69235), after ancient iron anchors were discovered in the sea. The survey, on behalf of the Israel Antiquities Authority, was performed by J. Sharvit (underwater photography), with the assistance of D. Planer, and S. Ben-Yehuda (GIS and drawing of artifacts) and M. Eliyahu (metallurgy). Additional assistance was rendered by A. Shmueli, T. Sadeh, A. Ben Shlush, A. Gan and A. Naor (lifeguards on the Netanya beach). The Netanya beaches extend from Havazzelet Ha-Sharon in the north to the Nahal Poleg estuary in the south (c. 7 km long) and are part of the Sharon cliff, characterized by a slope that is sometimes upright (75°–90° inclination), which rises to an elevation of c. 50 m and separates the coastal plain from the strip of beach and the shoreline (Figs. 1, 2). The cliff line is uniform and there is one natural passage through it to the beach at the mouth of Nahal Poleg; other passages leading to the beach were breached in the kurkar ridge in the modern era. The Sharon cliff is subject to severe damage due to the action of the waves at the base of the cliff, as well as the rain and wind. The seabed in the vicinity of the survey area is mostly rocky, but has pockets of clay. There are boulders on the bottom that slid into the sea and underwent marine erosion, in addition to beach rocks. The rocky seabed is the submerged western part of the kurkar ridge, which has undergone marine abrasion; it extends for a distance of 100–150 m west of the shoreline (max. depth 2–3 m). An elongated and fragmented rock shoal (width c. 150 m, depth beneath surface 3–5 m), c. 300 m from the shoreline, is probably a remnant of a submerged kurkar ridge. The survey area (length c. 1,300 m, width c. 300 m) was bounded by Sironit beach in the north, the Carmel Hotel in the south, the shoreline in the east and the rock shoal in the west. The survey was conducted by a team of divers, accompanied by a rubber boat carrying navigational equipment (GPS), along perpendicular lines running from the shoreline to the rock shoal in the west. The seabed was surveyed from the shallow water next to the shoreline to c. 300 m west and to a depth of 5 m. Five stone anchors and a stone disk were discovered in the survey. Other anchors were discerned in the northern part of the survey area, near Sironit beach (central map reference 18545/69142), but were not documented due to the sea conditions. 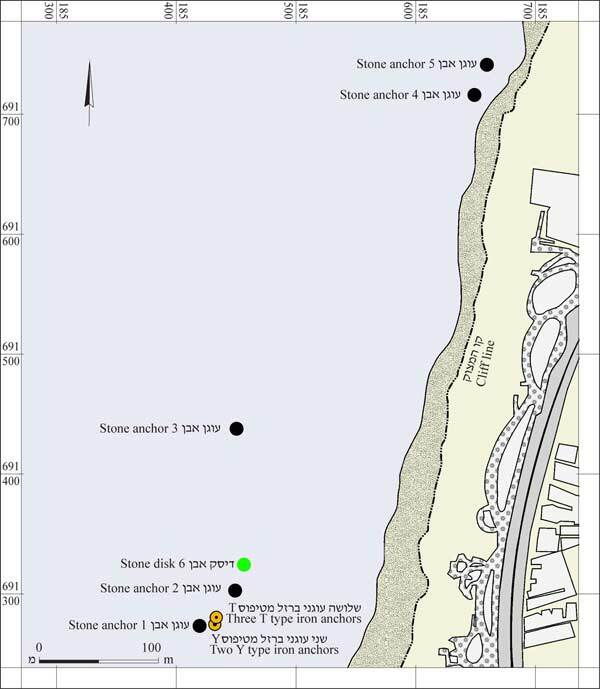 Five iron anchors dating to the Byzantine period were discovered in the southern part of the survey area (central map reference 18543/69126), at the foot of the Carmel Hotel. Another iron anchor had previously been discovered by a lifeguard on the beach, c. 100 m south of the site and was transferred to the State Treasure storerooms of the Israel Antiquities Authority. It was noted during the survey that the rocks on the shallow seabed were clean of algae and marine biological activity; hence, they were presumably covered with sand for a long period of time, which was removed by storms shortly before the survey was carried out. 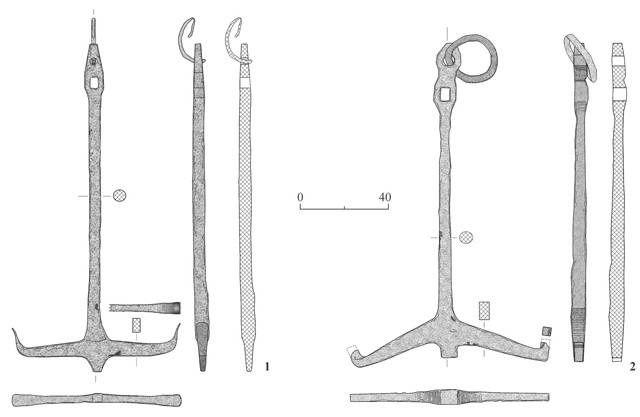 Five stone anchors with a single perforation for tying a rope (Fig. 3:1–5) and a stone disk with a hole in its center (Fig. 3:6) were discovered. Two of the anchors were removed from the sea and transferred to the offices of the Israel Antiquities Authority, whereas the other three were left in situ. Stone Anchor 1 is made of hard limestone; it is the largest anchor discovered at the site (0.3×0.6×0.9 m; c. 150 kg). The anchor is rectangular and its upper corners are rounded. Its bottom part is wider than the top and the two parts are separated by a small hewn step (width c. 5 cm). Directly above the step is a hewn bi-conical perforation (diam. 0.10–0.15 m). The base of the anchor is flat, thereby allowing it to stand. The anchor was left in the sea. Stone Anchor 2 is made of hard limestone and has a trapezoidal shape (0.20×0.40×0.55 m; c. 60 kg). Its pointed base has a triangular cross-section, forming a kind of inverted pyramid. A through-hole, which is wider on the exterior (diam. 0.12 m) than on the interior (diam. 0.1 m), is perforated in the upper third of the anchor; the sides and angles inside the perforation are straight. The anchor was left in the sea. Stone Anchor 3 is made of hard limestone and has an irregular shape (0.20×0.38×0.50 m; c. 50–60 kg). A through-hole, wider on its outer part (diam. 0.1 m) than on its inner part (diam. 0.08 m), is perforated at two thirds of its height; the sides and angles of the hole are straight. The anchor was left in the sea. Stone Anchor 4 is made of grayish light green non-indigenous granite (0.08×0.38×0.54 m; c. 30 kg). The anchor is rectangular and appears to be broken on the bottom. One side of the anchor is straight and the corners on the other side are rounded. A biconical through-hole (diam. 6.0–9.5 cm) is hewn in the upper part of the anchor, which was removed from the water and transferred to the offices of the Israel Antiquities Authority. Stone Anchor 5 is made of hard limestone and its shape is irregular (0.27×0.37×0.53 m; c. 60 kg). A biconical perforation (diam. 7–18 cm) is hewn in the middle of the anchor. The anchor was found next to an iron anchor from the Byzantine period and as a result of the contact, iron oxide was formed on the stone anchor, which was removed from the water and transferred to the offices of the Israel Antiquities Authority. Stone Disk 6 was discovered next to Anchor 2, at a depth of 3.9 m beneath the surface. The symmetrical disk (diam. 0.39 m, thickness 4 cm) is made of grayish light green granite, similar to Anchor 4. A square perforation (4×4 cm) is hewn in the center of the disk. The exact function of the stone disk is unclear. It was apparently used as a whetstone or flywheel in some device, rotated by means of a square axle. Five iron anchors were discovered lying on the seabed, c. 150–200 m from the coastline, at a depth of 3–4 m below the surface. All the anchors were discovered without an integrated stock; no anchor stocks were discovered in the survey. Three of the discovered anchors are Type T and the other two are Type Y. The anchors were documented and measured; only two of them—one of each type—were removed from the sea for further study. The anchors of the same type are identical in shape and dimensions. The iron anchors were found covered with a thick layer of marine encrustation, composed of iron oxide and local sediments that formed a sealed conglomerate around the anchor. The net weight of each anchor, without the marine encrustation, is estimated to be 60–80 kg. The anchors, resting on the seabed and discovered without an anchor stock, were presumably used as spare anchors in ships that were wrecked at the site. Type T Anchors (length 1.5 m, length of arm 0.4 m; Fig. 4:1). The shank is round (diam. 6 cm) and its top terminates in a widened rectangle (width 9 cm), with a rectangular perforation (4×6 cm) in its middle for the insertion of the anchor stock. The upper end of the anchor terminates in a rounded point; the round perforation (diam. 3.5 cm) in its center was used for an iron tethering ring (diam. 0.25 m). The ends of the arms (thickness 4 cm) are pointed and bent upward at a right angle (length 8 cm). While removing the marine encrustation from one of the arms of the anchor removed from the sea, remains of an ancient rope made of organic fibers were discovered. This rope was either caught beneath the anchor or was tied to the anchor. One of the arms was broken on one of the three Type T anchors discovered (Fig. 5). It is customary to date the Type T anchors to the Late Roman and Byzantine periods. Type Y Anchors (length 1.5 m, length of arm 0.48 m; Fig. 4:2). The shank is round (diam. 6 cm), and its top becomes wider and rounded with a rectangular perforation (4×6 cm) for inserting the stock. The tapered upper part of the anchor’s shankhas a rounded hole in its center (diam. c. 4 cm) and an iron ring (diam. 023 m) was preserved inside it. The arms (thickness c. 4 cm) slant down at an obtuse angle relative to the shank (c. 110°), and their ends are pointed and bent upward at a right angle (length c. 4 cm). It is customary to date Type Y anchors from the Late Byzantine until the Crusader periods (seventh–eleventh centuries CE). The removal of ancient iron anchors and other iron items from the sea entails a serious question of conservation. Conserving ancient iron objects from the sea is more difficult than treatment of other metallic items discovered underwater, such as those made of lead, copper, bronze, silver and gold. This difficulty is also encountered today when conserving buildings near the sea. Iron in the sea is corroded at a rate five times that of iron on land, due to the high concentration of salt in the water (Hamilton D.L. 1999. Methods of Conserving Archaeological Material from Underwater Sites. Texas A&M University, College Station). Shortly after removal from the sea, the anchors undergo rapid destructive processes, whose intensity greatly depends upon the quality of the iron they are made of and the length of time they rested on the seabed. The most common treatment for conserving and restoring metal is cleaning—mechanical, chemical or electrical (electrolysis)—which is meant to remove corrosion from the surface of the metallic object. Many ancient objects can only be cleaned mechanically. Conservation outside the water is performed in three stages. The first stage involves the isolation of the artifact from an oxygen-rich environment by immersion in a 5% solution of NaOH, while controlling the temperature and pH level. During the immersion, the chlorine ions leave the iron. The primary goal of this stage is to minimize the rate of corrosion and this first stage is only implemented if a long time will elapse until the marine encrustation is removed from the iron object. In the second stage, the marine encrustation is removed followed by the removal of the corrosive layer by means of electrolytic reduction or sand blasting. In the third stage, after the corrosive process has been halted or significantly slowed, the artifact is treated with corrosion inhibiting materials or rust converters, to facilitate the storage or display of the object in open air. The conservation of large iron objects recovered from the sea, such as cannons and iron anchors, is both complicated and costly; therefore, in most instances they are not removed from the see, but documented in situ. Objects are usually removed from the sea when they are in danger of being stolen or destroyed. Recently, a technique for conserving iron marine artifacts in situ has been developed, whereby a sacrificial anode (zinc or magnesium) is attached to the iron object, similar to what is done nowadays to boats that are at anchor in the water. Stone anchors are among the most common finds on the seabed and in many studies they were referred to as a means of dating, similar to the use of pottery in excavations on land. 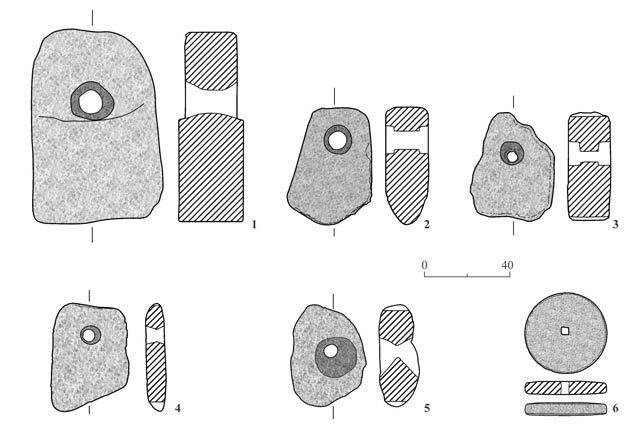 The English scholar H. Frost developed a typology for stone anchors, which relies on her study of anchors discovered in land excavations at Ugarit-Ras Shamra, Kition and other sites. The usage of stone anchors, discovered along the coast of Israel, for dating seems to be rather difficult. The stone anchors were widely used as anchors in small fishing boats and as weights for fishnets from the Bronze Age until the modern era, because stone is a readily available and durable material. Anchors discovered in Israel have been used for dating when the anchor has a distinctly characteristic shape, such as the “Byblite anchors” or the “Syrian anchors” or in instances when the anchor bears an engraving that can be identified and dated. The stone anchors from this survey were discovered out of any archaeological context and it is therefore difficult to date them. Based on their similarity to other previously discovered anchors, it seems that the stone anchors in the survey should be ascribed to sailing vessels from the Byzantine period. A similar assemblage of anchors was discovered in the shipwreck “Dor D” that is dated to the mid-sixth–early seventh centuries CE (Kingsley A.S. and Raveh K. 1996. The Ancient Harbour and Anchorage at Dor, Israel [BAR Int. S. 626]. Fig. 44; Kingsley A.S. 2002. A Sixth-Century AD Shipwreck off the Carmel Coast, Israel [BAR Int. S. 1065]. Pp. 9–10, Figs 22, 23), as well as the assemblage from the ship “Dor F” that is dated to the fifth–mid-seventh centuries CE (Kingsley A.S. and Raveh K. 1994. Stone Anchors from Byzantine Contexts in Dor Harbour, Israel. International Journal of Nautical Archaeology 23.1:1–12). One of the most prominent features of all the ancient stone anchors is a biconical perforation that was hewn by means of a hammer and chisel. A special feature of Stone Anchors 2 and 3 from the survey is the perforation cut at a right angle, as opposed to the biconical perforation that characterizes most of the anchors discovered in the Mediterranean Sea off the coast of Israel. Presumably, this special shape of perforation is a local characteristic, although it might also be a foreign feature of unclear origin. Hence, the sailing vessels that used these anchors were either local boats for coastal trade or probably foreign vessels that were moored along the Netanya coast. The Type T and Type Y iron anchors, like those discovered in the survey, are known from many sites in the Mediterranean and Black Seas. G. Kapitan (1984. Ancient Anchors–Technology and Classification. International Journal of Nautical Archaeology 13:43) divided the iron anchors into five groups based on the shape of the arms. The anchors discovered in the current survey match the two latest types in this classification. He dates anchors with straight arms (Type T; Type D according to Kapitan’s typology) to the Late Roman and Byzantine periods. Anchors of this type were discovered in surveys off of the coast of Mount Carmel, at Newe Yam, Dor, Caesarea, Apollonia, Yavne-Yam and Ashqelon. Two anchors of this type were discovered in the shipwreck Tantura F that was excavated in 2004–2008; they were dated from the second half of the seventh to the eighth centuries CE (Eliyahu M., Barkai O., Goren Y., Eliaz N., Kahanov Y. and Ashkenazi D. 2010. The Iron Anchors from the Tantura F Shipwreck: Typological and Metallurgical Analyses. Journal of Archaeology Science 38:233–245). Type T iron anchors were discovered in a shipwreck excavated at the site of Cefalu in Sicily, where they were dated to the mid-sixth century CE. Kapitan dates anchors with arms that slant downward (Type Y; Type E in his typology) to the Late Byzantine and Early Islamic periods. Anchors of this type were discovered during the dredging of ‘Akko harbor (HA-ESI 114:13*–14*) and in the shipwrecks at Yassi Ada and Serçe Limani in Turkey; they were dated from the seventh to the eleventh centuries CE. In surveys and excavations conducted at Cape Camalti on the northwestern coast of Marmara island (Kocabas U. 2009. Camalti Burnu I shipwreck. In: Bockius R. [ed]. Between the Seas: Transfer and Exchange in Nautical Technology [Proceeding of the Eleventh International Symposium on Boat and Ship Archaeology, 2006]. Romische-Germanisches Zentralmuseum, Mainz. Pp. 227–237) five Type Y anchors were discovered inside the shipwreck and thirty-two were scattered in the harbor, including thirteen of Type T and eighteen of Type Y. Two Type Y anchors and one Type T anchor were also discovered in the Camalti Burnu I shipwreck on Cape Camalti. The excavation finds indicate that this was a merchant ship, 25 m long with a capacity of c. 100 tons that transported c. 800 wine amphorae. The boat was dated to the thirteenth century CE. Several scholars think that the Type Y anchor is a development of the Type T anchor that preceded it, aiming to prevent the anchor from becoming deeply embedded in the seabed and reduce the load on the shank and the arms. Other scholars believe that the two types were used simultaneously during the eleventh–thirteenth centuries CE and share no common technological development. Numerous fragments of Type T anchors from the Byzantine period were discovered in surveys conducted along the coast of Israel. Most of the anchors were broken in the region of the connection between the arms and the anchor shank, or the anchor shank broke close to the arms. The anchors were assembled from several parts by means of annealing, and the weakest points are the joins between the parts. The manufacture of the Type Y anchor, where the angle between the shank and the arms is obtuse, was presumably meant to reduce the load exerted on the connecting points between them and thereby minimize the likelihood of the arms breaking. Based on a comparison to other anchors, it seems that the Type T anchors should be dated to the fourth–eighth centuries CE and the Type Y anchors to the seventh–thirteenth centuries CE. Apparently both types of anchors were used during the seventh–eighth centuries CE. It is possible that some of the anchors were in secondary use or reused since the iron was valuable. The absence of anchor stocks, complete or broken, on anchors discovered in the survey, as well as the fact that no anchor stocks were discovered at all in the survey, probably shows that the origin of the anchors is in boats that were wrecked on the beach. 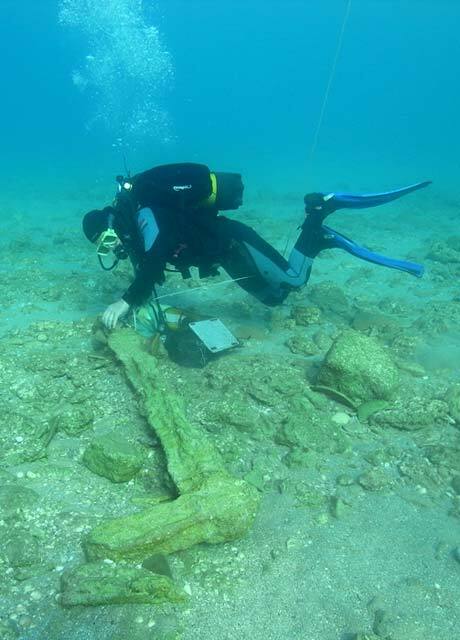 It seems that these anchors were used as spare anchors in boats and when the boat sank they settled on the bottom of the sea; the hull of the boat, which was made of wood, was not preserved due to the rocky seabed and the shallow water in the survey area. The discovery of the survey finds on the rocky seabed, which is a remnant of the coastal kurkar ridge, indicates that already in the Byzantine and Early Islamic periods, natural destructive processes occurred along the western side of coastal kurkar ridge, similar to the situation today, but at a slower rate. It seems that the coastal cliff in these periods was further west and not as precipitous as the cliff today, and there may also have been a road on it that connected the beach with the settlements to its east. The survey finds indicate that that during the Byzantine period, there was apparently some site in the area that served as an anchorage for sailing vessels. Remains of a church that was decorated with mosaics and included prayer and baptismal installations were exposed in an excavation conducted in 2004 at Qiryat Nordau in Netanya (Permit No. A-4093), c. 2 km from the beach, Near the church were numerous remains of dwellings, as well as industrial and commercial structures that dated to the Byzantine period. The excavators suggested that the site served as a way station on the main road that connected Caesarea with Jerusalem. The anchorage site that probably existed on the beach in Netanya was perhaps associated with the way station exposed in the excavation. In the wake of destruction of the coastal cliff in the Netanya region a plan is being formulated to build a series of detached breakwaters in the coming years that will protect the cliff from the erosion of the waves along its base and prevent its collapse. Within the framework this project, it is anticipated to perform a systematic survey that will supplement the information regarding the site and the region. 2. A schematic cross-section of the Sharon coast. 3. Stone anchors and a stone disk. 5. A Type T iron anchor discovered in Caesarea; one of the anchor’s arms is broken.